Random snippets of interesting knowledge that tickles my fancy, facts, current events, art, diy, photos, travel experiences and just about anything I can think of. 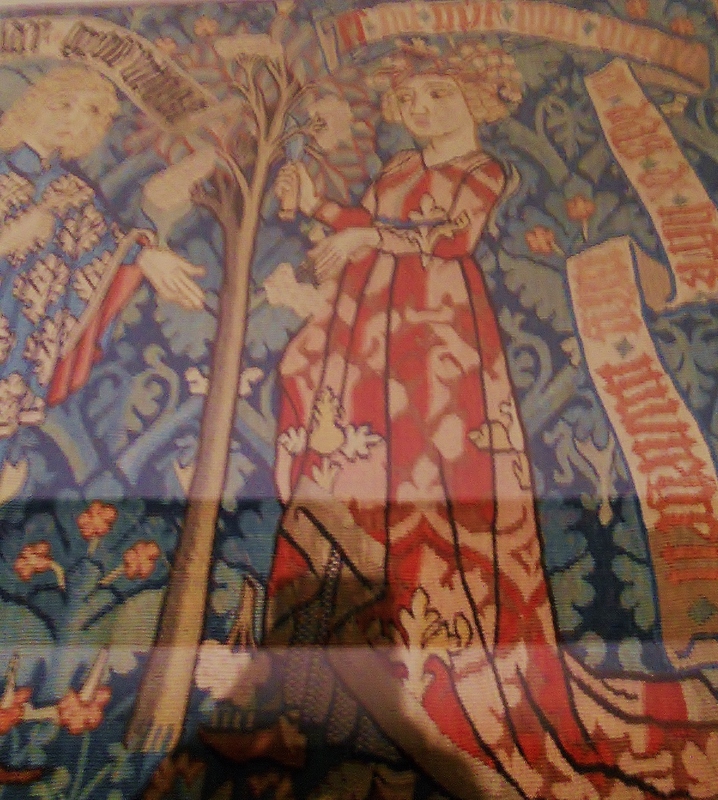 I had the opportunity to visit the Cluny Medieval Museum, which I had never been to. It was a wonderful experience to see the different art work of that era (650-1400 c.e.) as I feel like this is a somewhat forgotten aspect of art history. The craftsmanship and talent of the Middle-ages surprised me greatly, changing my outlook on the so called “Dark Ages” completely. 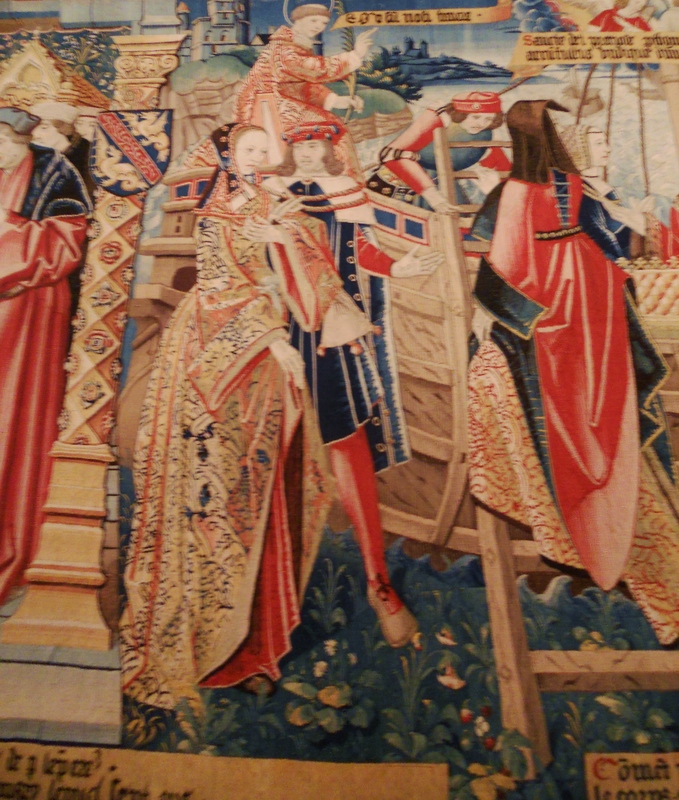 What fascinated me the most were the massive tapestry panels. The sheer size of them alone is awe-inspiring. But they are so rich in detail and pattern that one truly has to wonder about the time and care an artist puts into these beautiful fabric masterpieces. 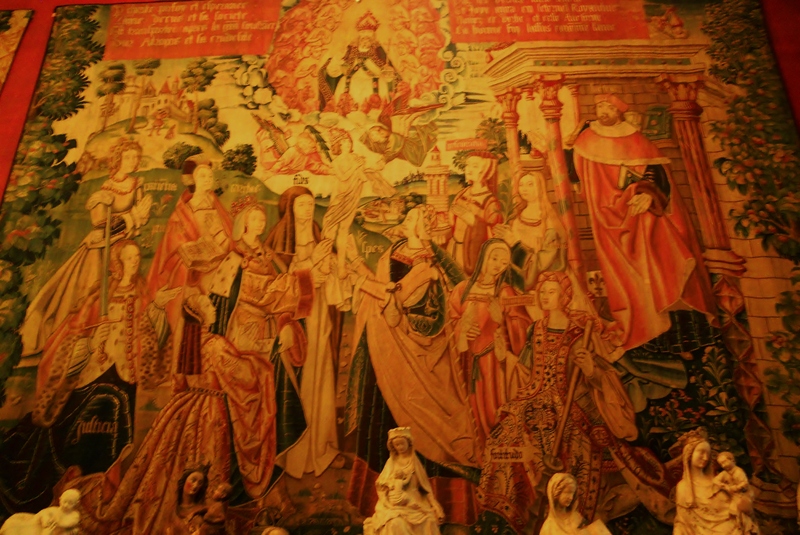 This elaborate scene showed the baptism of a French prince and showed the divine blessing on his future reign. I found it fascinating as nearly every person of the prince’s entourage was female. Beautiful noble women dressed in their finest, surround and supporting the future sovereign. Each lady has a small caption, naming each also. The occurrence of text and words in tapestries was unknown to me and I found it a little out of place but of great historical importance. It leaves little room for misinterpretations. The scene takes place in an elaborate background, nature, especially flowers and plants had great symbolic values and you can find them in nearly every piece. Another slightly surprising thing I found at Cluny was this strange pose of the Madonna. I’d never seen them in this tilted pose, holding the baby on their hip with such a pronounced curve. Usually Madonnas are much more stiff and standing straight. But I feel like this pose made her seem more human and approachable. Religious art was THE most important theme to be found here. The sheer quantity was staggering. 9 out of ten pieces, if not more, were depicting some kind of Christian scene, character or event. 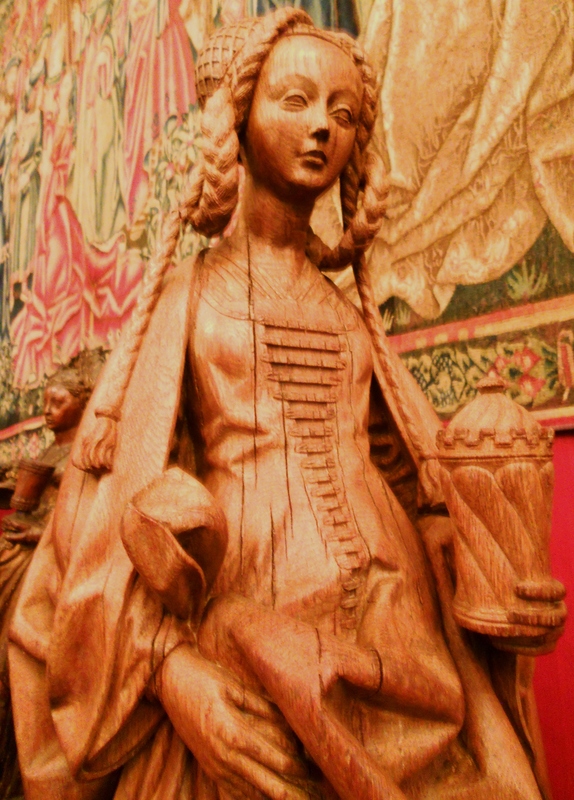 The wood carving ability of medieval artisans should definitely be mentioned. This piece struck a chord with me. Saint Madeleine’s statue was slightly smaller than true size, but her presence compensated for it. Her dress was a complicated mess of folds and creases and it was hard to believe she was made of wood at all. 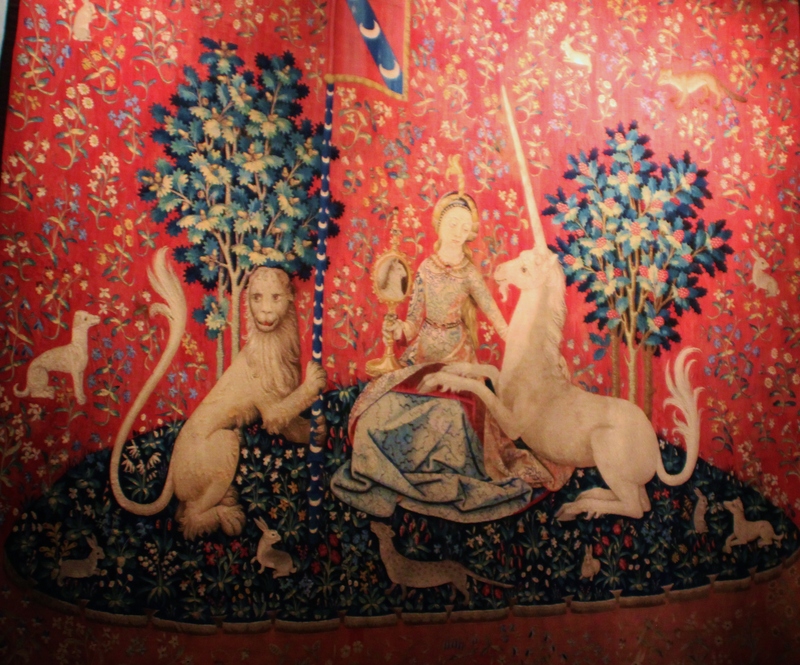 The most famous series of tapestries is beyond a doubt the Unicorn collection. It is a five piece series, each showing a noble maiden in a fantastic, imaginary place filled with plants, flowers and small animals. Each scene presents her with a lion and a white unicorn and each represents a different sense. This one here, shows the sense of sight, symbolized with the mirror. It was interesting to see the different representations of these senses throughout the room. And for once, to not have a major Christian theme in these pieces. This entry was posted in Daily Loaf, Sprinkles and Frosting and tagged art, art history, Cluny, female, female figure, madona, marie, medeival, middle ages, museum, mysteries, saint madeleine, tapestries, tapestry, travel, unicorn, wood sculpture by acc1313. Bookmark the permalink.